Traveling to Bristol from London is straightforward and fast enough to make day trips easy and fun. This university city is Banksy's hometown and the street art capital of Britain. It has a buzzy waterfront, a cool covered market, one of the best science museum/science playgrounds in England and some fine Georgian neighborhoods with good pubs. Use these information resources to compare travel alternatives and to plan your journey. The city is home to one of Europe's best annual hot air balloon festivals. And fans of historic feats of engineering should make time to visit the Clifton district to walk across the scenic Avon Gorge on the Isambard Kingdom Brunel's beautiful Clifton Suspension Bridge. Great Western runs direct trains from London Paddington Station to historic Bristol Temple Meads throughout the day. The journey takes about an hour and 45 minutes and tickets can be found using the National Rail Enquiry Cheapest Fare Finder. National Express Coaches from London to Bath take about two hours and 45 minutes the cost will vary depending upon how far in advance you buy your tickets and what time you travel. Generally, there are a limited number of cheaper tickets for every trip which, naturally, are sold out first. Buses travel between Victoria Coach Station in London and Bristol Coach Station regularly throughout the day. Bus tickets can be purchased online. There may be a variable booking fee depending upon the type of ticket you buy. Paper tickets, e-tickets that you print yourself and m-tickets for mobile phones are all available from the website. 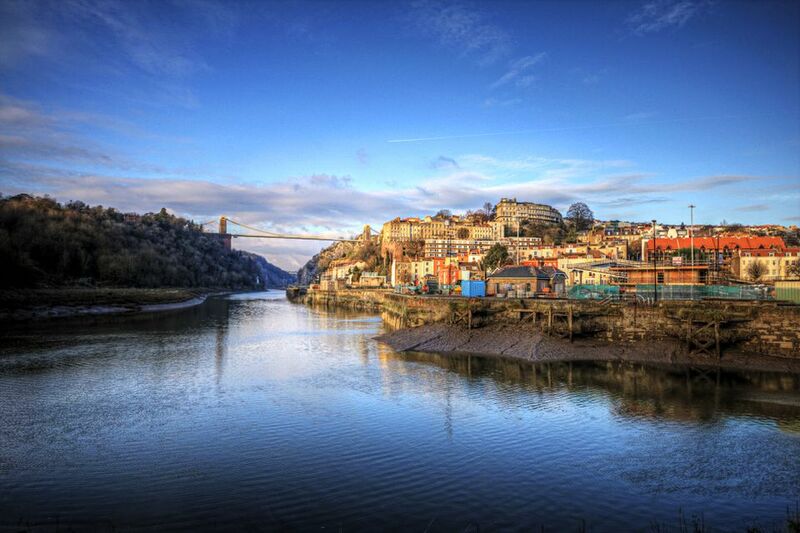 Bristol is directly west of London - 118 miles from Trafalgar Square via the M4 motorway. Depending on the traffic, it can take anywhere from two to three hours to drive. Keep in mind that gasoline, called petrol in the UK, is sold by the liter (a little more than a quart). Parking in Bristol may also be expensive but there are several Park and Ride options on the outskirts of the city that are quite reasonably priced. Use the Automobile Association Route Planner to map a route with suggested stopovers and gasoline stations. UK Travel Tip: The route between London and Bath is also one of London's major commuter routes and the main road from Heathrow Airport to London. Traffic jams that are virtual standstills can happen at any time of day. If you plan only a day trip, train or coach travel makes more sense. But if you do plan to drive, there is plenty to do for an overnight trip with more than enough to keep you busy for a couple of days. The highly recommended Hotel du Vin is in the center of Bristol. It's luxury at comparatively moderate prices, dog-friendly and has a good restaurant. Plus it's right in the middle of things.